This entry was posted in art, classical music, culture, music, poetry and tagged classical persian music, hafiz, mastan, poetry hafez, wine by Michele. Bookmark the permalink. Indeed nice collection of poetry and miniature artworks. Though mullahs managed to suffocate bars and taverns in Iran, they will never be able to asphyxiate the wisdom. Mastan’s poetry is talking about what is happening beyond the closed doors of the liquor stores. Wine and the intoxication from wine is a metaphor used to relay the message of liberation from limiting rules in search of freedom of choice. One can be (Mast) drunken not drinking wine and alcohol. And one can drink (May) not drinking wine. Intelligence of words allows the poet to criticize reality when talking about the truth. Homaay is an always Mast (drunk) who does not need alcohol to get drunk. He is talking about the closed minds (liquor stores) not letting drunkenness spread the joy in Iran and hence the world. And I wrote this note to remind not to get reality with the truth confused. Iran’s Dry Laws are akin to America’s prohibition in the 20’s and early 30’s. Prohibition was also driven by a religious movement; America’s prohibition was the fruit of Protestant thinking and Iran’s is the gift of Islamists. What’s of interest is that whenever one consciousness altering mean is prohibited by law, another flourishes. Alcohol is illegal? Let’s get drunk on chanting! The common denominator, of course, is getting drunk! The means justifies the end. 🙂 Dont’ get me wrong. I love traditional Persian music, although I must confess I can listen to it for no more than half an hour at a time. Any longer and the santoor strings’ reverberations begin to play guitar with my neural cords. Makes me feel like I’m in a time warp and have landed in Nader Shah’s court or in a random Hezar Dastan episode! 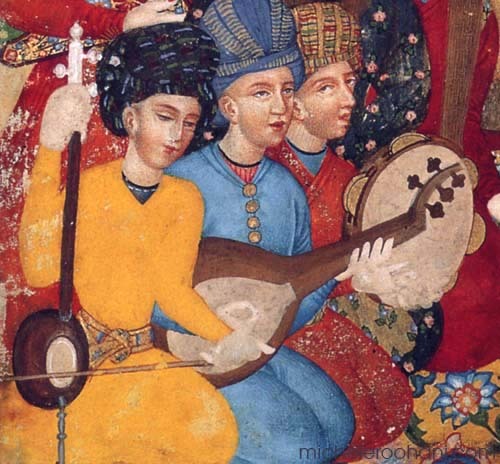 What’s interesting is that the rise of traditional music has been caused by this dry period in Iranian history. I assume, by that logic, that as soon as ethanol becomes legal and hits the streets we’ll be heading straight back to listening to Andy, Kourosh, and Shram Shabpareh! God! This very notion keeps me a skeptic on the subject of legalization. Don’t get the face of political rhetoric too seriously. 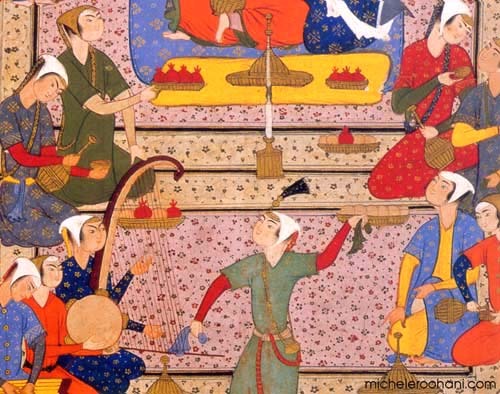 Nobody has taken away music and wine from the Iranians’ life. The very band you went to see is a proof that even the government of Iran doesn’t mind “music” that’s about “wine”. Congratulations on a great piece of work which undoubtedly took a lot of time & effort! As to the Iranian traditional music I must say that in general I never liked it. As a kid it made me sad, and as an adult it reminded me of those sad times! It may be deemed as shallow but the new “music” of Vigen (which opened the dam for others) is what I still reminisce fondly about my 16 years of youth in Iran. Your visuals are stunning though I had seen Iranian miniature paintings at various museums around the world and in Iran during my visit there in 1976. Talking about Persian wine tradition, there is a book by Najimieh Batmanglij entitled “Persia to Napa”. I looked at it while visiting the Darioush Winery tasting room in Napa Valley a couple of weeks ago. 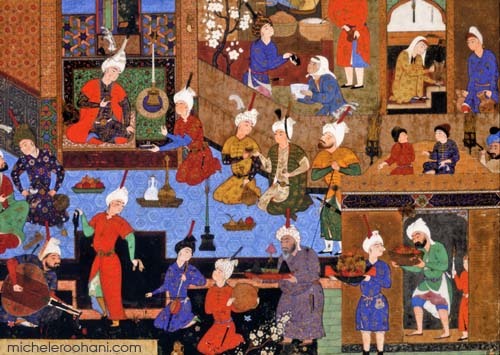 It has the usual lush photos of food and wine along with many pages of beautiful old photos of the works similar to what you show here that introduce the ancient history of Persian wine drinking. So girl, you hit on a wonderful subject again and it pleases us all. 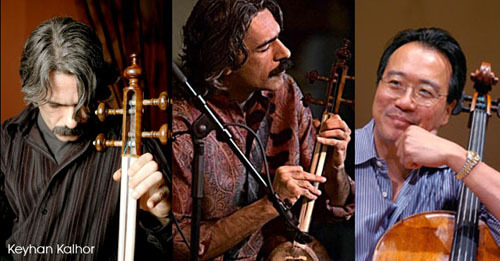 Although not professionally, as a Persian traditional musician, music critic, and a tutor all my adult life, I have so far seen and admired Mastan’s video of their concert that was recorded in Niavaran Palace in Tehran in summer 2007. Homay has definitely offered a new facet of the Iranian music repertoire by infusing new musical ideas combined with meaningful poetries. An adherence to purity and originality that stays away from the Western musical concepts such as full harmonization, etc. It is not the first time in Iran’s long history when music combined with poetry begins moving and uniting people against oppression when nothing else works. A prominent example would be Aaref Ghazvini in Mashruteh era. My wife and I managing the Nava Music Society Inc. in Rockville, MD, are looking forward to their next performance in Bethesda, MD on July 20th, 2008. I enjoyed the article, and I definitely enjoy the music, it takes to me to a different level of consciousness, it is the most amazing experience. 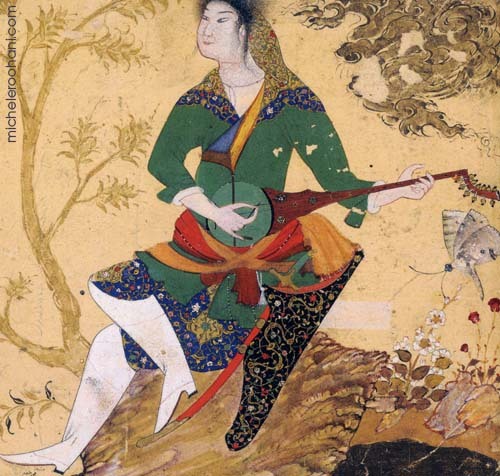 I too have a tendency to get sad when listening to Iranian traditional music, but as I listen to the lyrics (poems, actually) the sadness is replaced with consciousness – I cannot find words to explain it. I have a question, whose poems are these? who wrote the poems? I heard Homay Parvaz did, but not only he is a bit young for today’s standards to benefit from such wisdom, some poems seems I have heard before his time. Anyone? Dear Mitra, Michele asked me to answer your question about Homaay. And here is my response if I ever could call it a response. Consciousness is a time-less value in every bit of living things. Consciousness level varies among beings depending on the level of their connection to the higher-self source. So the higher the connection of one to the truth the higher his/her level of consciousness would be. When something is time-less it is age-less. Hence Homaay, though too young, could have a high level of consciousness and wisdom. Homaay is an in-love living in hell. He feels it but does not burn. He sings it but does not fear. He sees himself in the hell therefore he can write the stunning Meeting with Hell Dwellers poem. I came to know him when I first encountered his poems. I have translated almost all of his first two albums (16 songs). He is a Chakaameh Sora, which means he writes the poems, he composes the music, and he plays and performs them all. That night he performed most of his own poems, a poem from Saeb Tabrizi, two quadrants from Khayyam, a poem from Parvin Etesaami and so on. Those sounded familiar to you were probably those from the well-known poets I pointed out above. Mehrdad, thanks for your comments, and it does answer part of my question, which is whether, he – Homay – has actually composed some of the poetry. I am totally impressed by his wisdom, which in this day an age, he seems to have a lot of it given his young age. However, the 2nd part of my inquiry remains – as I am not into Persian poetry therefore unable to tell when he is quoting other timeless poets and when he is reciting his own. You mention you have translated some of his work- where did you find his work? How can I get some of his work and also your translations? I am so enjoying this young man’s exceptional performance and of course the rest of the band’s. It is quite a missile! and has kept me engaged for a few days since I discovered it by a mer coincidence. If I may take this opportunity to thank you and Michele for this enlightening exchange. I am enjoying this Blog and I will visit again with some comments about what I have read here. I am glad I could answer part of your question. Regarding your second part of question. I cannot help you. It is a knowledge based question. But, you can go to Youtub and search for Mastan and Homay. You will find his work to listen. Also do a Yahoo search for his site. You can find his poem there. I had it on my weekly reflections. If you want to see my translations I need to have your email. I have a weekly poetry reflection and I would be glad to include you in my mailing list. I have already posted two or three of Homaay’s work. OH, he sent me his works for translation through another friend and promoter. I am sure those who listen to Homaye or others on U-Tube or in their CD players can simply choose to turn it off!! – They don’t need to be offensive to other artists when they express their likes or dislikes. The ‘Turn off’ button is what people in Iran don’t have which is what Homaye is telling us so eloquently. My heart goes out to my brother’s family and neighbors who in Tehran do not even have the option of turning down the sound of Azzaan Broadcast through extremely loud and deafening speakers (– let alone OFF) every morning shortly before sunrise. Yes, it is ironic that we have seen Iranian traditional music flourish during the past 30 years, but wouldn’t we rather not see such development if it meant such atrocities against a people. Let’s keep perspective here. Please do not give credit to the perpetrators but rather to those who are finding a healthy and meaningful way to voice their pain under tremendous pressure. This is the least Iranian expatriates who live in the free world can do for their people. So Iran Dry? Well, Iran has Dry Laws, but it is not so dry! Actually it is quite ‘spirited’ if you get my drift! There is plenty of ethanol- and rest assured, people listen to Andy and Shahram! Too), the difference is that if you get caught you better share or else! To draw parallels between Iran’s ban on the consumption of alcohol and Prohibition era in the United States- isn’t it a bit of a stretch? Basically we’re comparing a brief –‘Prohibition era’ period that now seems like not even a fraction of a minute in history in the west –to the strict laws against alcohol consumption in the Islamic world that spans over many centuries, and continues to date- and cousin K cannot even argue against such a ban and root for legal use of it because, well, it is based on Sharia? And you can’t touch that? How did we make such a leap? 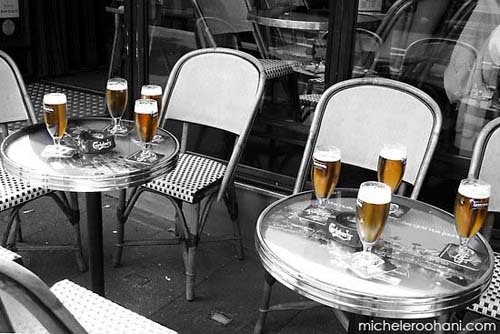 Currently most countries have STRICT LAWS & REGULATIONS, for consumption of alcohol (and drug abuse, for that matter) due to a number of reasons. What they don’t have is harsh, cruel and unusual punishment for alcohol consumption. It is basically a controlled substance issue for obvious reasons. However, in most Islamic countries, and specifically in Iran, the use of alcohol is dealt with extreme measures (at least on paper – in practice? it is a completely different story!) leading to unusual thirst for its consumption creating a black market for it, and a fertile ground for breaking the law and the snow ball effect of corruption that such violation brings about. Often times it is just an excuse to arrest people! A threat always dangling over your head! Pernicious, ha? What I get from all this euphemism ‘may-O Saghar’ etc. 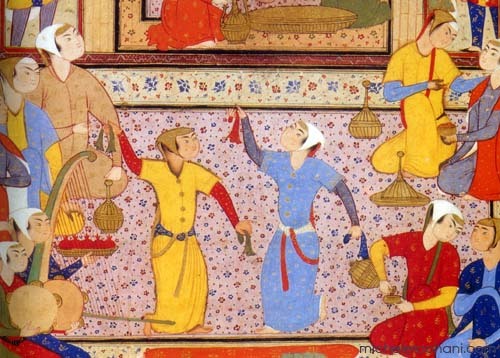 in traditional Persian Music is an outcry against lack of basic freedom–not ‘simply wanting to get drunk’. There are plenty of drunks in Iran! Real, wet drunks, not dry ones! Obviously people are willing to risk fines, arrests and public humiliation to drink. This poet is talking about basic freedom and human rights and it is so delightful to listen to him for hours on end, as long as I have the option to turn it off at my heart’s desire! Priceless. 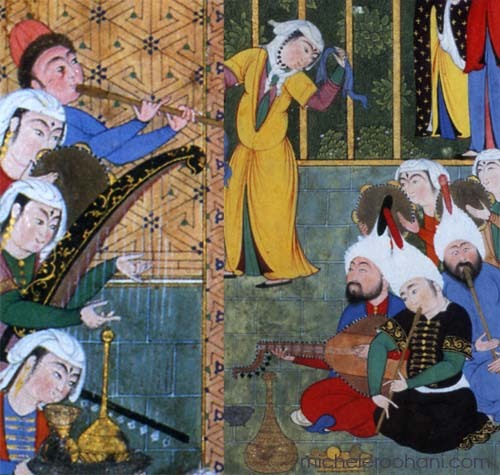 I agree with the description of Persian music and its “passionate improvisation”. Except I don’t know why you have to put your blog’s URL onto the images — these images are part of humanity’s history and belong to everyone. i am glad you like the post and to answer your question i have to say that my URL is not on the images; there is the name of the image, the date and where it is coming from (museum, etc…) and my name because you are seeing it on my blog. it takes days to make each of these posts and my blog, being free of all advertisement, belongs to me and only me! I never publish an image that doesn’t belong to me without mentioning the source and everything else is of my own creation (composition or photography).